Vincent Fantauzzo painted his portrait of Australian actor Heath Ledger in December just weeks before Ledger died in New York in January. Born in Perth in 1979, Ledger’s many film credits include Brokeback Mountain, for which he scored an Academy Award nomination, I’m Not There and Candy. He will be seen this year as The Joker in the new Batman movie The Dark Knight. Born in England in 1977, Fantauzzo came to Australia as a child and has a Bachelor of Fine Art (Painting) and a Master of Fine Art from RMIT University, Melbourne. He has had solo exhibitions at Dianne Tanzer Gallery in Melbourne in 2007 and 2008 and in Mumbai India in 2007. 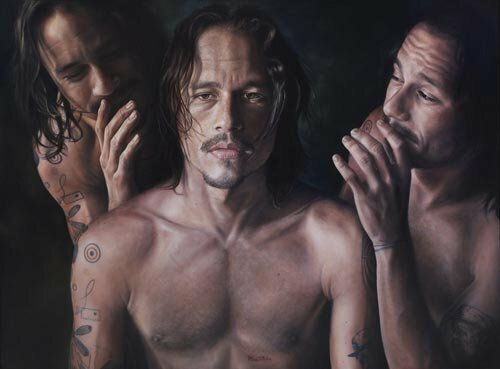 He won the 2003 Tolarno RMIT Partnership Prize and was a finalist in the 2007 Shirley Hannan Portrait Prize, DLAP, Whyalla Art Award and Duke Gold Coast Art Prize. The Ledger family, in particular Sally, Heath Ledger’s mother, and Vincent Fantauzzo have jointly decided to donate this painting to the Art Gallery of New South Wales.